Homes on land purchased by Jews to be demolished after government fails to examine other options. Homes built on land purchased by Israelis may be destroyed despite a government promise to protect them until their legal status could be determined. Deputy Attorney General Dina Zilber recently sent a letter to the IDF Civil Administration ordering it to destroy several homes that remain standing in the community of Migron in the Binyamin region, Haaretz reports. 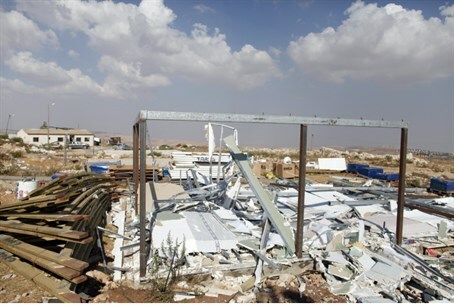 Much of the town of Migron was destroyed after Palestinian Authority resident Arabs claimed ownership of the land on which it had been built. Officials agreed to destroy the community even after the Arabs who claimed the land withdrew their lawsuit when requested to present proof of their claims. The Attorney General found that the claims could not be substantiated. However, the Courts ruled that land not registered as state land is de facto not to be settled by Jews. However, the government took a different approach regarding 17 homes belonging to Israeli residents who had documents proving that the land on which their homes had been built had been legally purchased. The Arabs registered as having sold the land to the 17 families disputed the sale, but the government agreed to wait and not to demolish the buildings for three months in order to allow their legal status to be determined. If the land sale was found to be valid, government officials were to have examined the option of allowing the buildings to remain as part of a small Jewish homestead. However, after the removal of most Migron homes in September 2012 the government made no progress toward the goal of determining the legality of the other homes. An investigation by the Israel Police’s anti-fraud unit failed to turn up evidence proving or disproving the legality of the land sale.